Did you know that approximately 65% of US households own at least one pet = 79.7 million homes (2016 APPA) and 77.8 million of dogs and 85.8 million of cats are suffering from obesity in USA? Also, more than 90 percent of owners did not recognize that their obese pets weighed more than they should. Look at the data here at pet obesity prevention association page for statics. When they are obese, it also can mean that those large number of pets would have possibility of getting various kinds of illness easier than fit and healthy pets. Just like human illness prevention, many of such illness can be prevented with healthy diet, daily exercise and more. However, if obese dogs become arthritis or diabetes, then, there would not be easy cure for them. Obesity affects the body in many ways, both how it functions and how it feels. Over time, the strain that extra weight places on the body can result in problems like joint pain and arthritis. In case of people, those who are overweight or have obesity have added pressure on their body’s ability to use insulin to properly control blood sugar levels, and are therefore more likely to develop diabetes. 90% of type II diabetes are over weight/have obesity. According to health network website, cancer is also one of the illness obese dog might face at higher rate. According to CBS website, a national provider of pet health insurance, found that insurance claims for conditions and diseases related to pet obesity rose by 10 percent over the past two years. In 2014, the insurance company received more than 42,000 claims for arthritis in canines, the most common obesity-related disease, with an average treatment cost of $292 per pet. Obese cats suffered most from bladder and urinary tract disease, with more than 4,700 pet insurance claims for those conditions and an average claim amount of $424. With any illness, it is much easier and cheaper to make an effort to prevent,rather than trying to go through the treatment after becoming ill.
You can read the full article on the obesity and illness in pets at the link here. You can read full article on pet obese on CBS website here and here. How to prevent your dog from obese.. Dogs rely 100% on their owners for the diet they eat and lifestyles they lead. I write in my blog entries all the time that, whether it is for people or for pets, diet is the base of the overall health and we need to focus on the better diet. I still do not understand why vet,who is a dog’s doctor pushes process food or their office has section of shelf to sell the kibble or canned food which is process food. With human doctor’s office, you would not hear that you should eat the process food to stay healthy and stay living longer happy life. That being said, first, I think whether you feed fresh food or processed food (kibble, canned food) might be the one step up point where you can guide your dog to healthy longer happy life style. If you cannot switch your dog’s diet to fresh food;homemade/raw diet, then, at least, try read the ingredient label and understand what you are feeding to your dog. As many people know, pet food ingredients are listed by weight. 1st ingredients weigh more than the latter ingredients. When I was attending puppy training class 6 years ago, our trainer had mini segment that let us learn overall dog things from nail trimming to food choice etc and,one thing she has mentioned is that, you should read the label and look for the products that has protein source listed within top 5 ingredients. Later, I also learned many more things such as..
1. If you are getting kibbles, then, ingredients should be named protein source not vague ingredients; Not “animal fat” but “chicken fat”,for example. 2. Find more than 1 animal protein source in the ingredients list close to the top in the ingredient list. 5. Avoid artificial colors,preservatives,and sweeteners etc..
“Splitting” is the way to make one ingredient into smaller category. splitting, it can make lamb or any other protein source look like most weight ingredients. For example, with kibble, lets say Blue letters are protein related ingredients, purple letters are vegetables, green letters are grain related ingredient, dark brown is other miscellaneous ingredients. You can see that it looks “good” at glance knowing the ingredients list starts off with protein source, but when you group it up, you can see that you find more purple and green ingredients than dark blue ingredients and, they are carbohydrates heavy food. Since majority of ingredients are grains and vegetables, you would find only small amount of meat in them,even though the kibble is advertised saying beef or other protein source is the number one ingredient. Dog needs protein more than vegetables. What can you do to make the meal more meaty to suit to your dog’s needs? That would make the food a little bit more fresher and more suitable for your dog. When you are feeding kibble, do not feed bone-in meat like drumstick at the same time. Second, looking through how and what other people are feeding through pictures, videos etc through social media, I feel people seems like feeding too much to the pet at a time. You must remember that treats also add calories, and it should be less than 10% cal of daily intake. Nice cute looking frosted dog cookies are marketed for mostly people customer in mind, rather than dog’s health: they are sugary and not healthy. Third, many people seems to consider dog diet just like human’s and, tend to add in flavoring or seasoning like.. adding peanut butter, honey and so on. For dogs, simpler the best. No need to add sweetener like honey just because dog likes sweet stuff. 1 tbs of peanut butter is 90 kcal and if you were filling dog chew toy Kong with peanut butter, you will be feeding hundreds of cal just with peanut butter as treats! Not only what to feed, how much you feed are the issue but also how much you exercise your dog. Dog needs physical exercise:daily walk, and mental exercise:training etc. Just 5 minutes at a time training for your dog lets your dog use their brain and it is good for them. How to judge your dog being at good weight..
As a general rule of thumb, dogs and cats should have a tucked waist when you look down on them from top, and you should feel the ribs. Just last month, Palette turned to 11 years old. I cannot believe she is with us for such a long time already. SHe was with us since 12week old. Time flies! For Palette, it was different year to previous year because just before her birthday last year, Liam came along. I think she would not mind that cleaning job at all. Since the time our little prince Liam turned around 11 months old, I started including once a day snack time. Since he is completely weaned off from breast milk or formula now, I am planning our son the snack time 2 times a day;one in the morning, one in the afternoon so he can get supplemental nutrition from those snacks. I make homemade healthy snacks for him, and it makes my schedule a little tight and limit things that I can do in a day.However, I decided to bake something special for our little princess;Palette too..
What I came up with was using the similar ingredient with Liam’s and tailor to her liking. Since she does not get to taste peanut butter often, usually I make her peanut butter something for her special day. Of course,with the healthy amount of peanut butter. 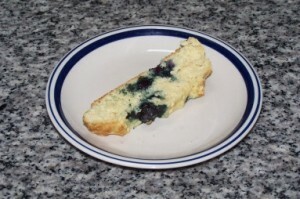 I ended up making peanut butter blueberry cake for her. Let me tell you she really really liked it. When I tell her to sit and wait, her drool bubbles came out from her mouth and I could tell she really loved it. If I let her,she would eat the whole loaf in one sitting:-) Guaranteed! She loved the cake very much so I gave her 2 slices but that is the max that I gave to her. After that,she is enjoying one slice a day. Many dog bakery offer peanut butter treats but bad thing about it is that you cannot tell how much of peanut butter is in them. However, I would imagine they would put more than 1 tbs peanut butter in the batch of cakes or biscuits. Dogs obviously love peanut butter, but it is not the healthy food for them to put a lot in the treats. Peanut butter is high calorie food. The creamy peanut butter 1 tbs is 90 kcal, so it means if you fill the small size kong toy for example, you are giving 158kcal (out of the 158kcal, 117 kcal comes from fat) just for your dogs to lick them each time. I used peanut butter but it is the amount for her to be able to smell it and not a lot of peanut butter in them.I wanted to make healthier cake for her even if using the fatty food ingredient. Since there is nothing people cannot eat it, my husband tried her birthday cake too. At our house, he usually asks me “Is it for a dog or for people”. Anyway, our Palette loved the cake so much that I decided to share the recipe with you. Make one for your furriends and you will become their best of the best friends enough for them to stalk you to everywhere you go. Peanut butter blueberry birthday cake.. This is sugar free , salt free except from tiny bit of peanut butter in it but it is healthy treat for your dog. Many pupcake recipes on the internet calls for peanut butter (1 tbs of peanut butter has 90kcal. It will make the homemade treats very sugary,fatty,high calorie treats if not careful how much to pit in), and some sort of sweetener such as honey,molasses,or sugary frosting and so forth, but fruits itself is already sweet enough and, I did not think it needed more ingredients as sweetener,and this one does not have those. For our little son, I make snack but like Palette’s principle, I do not like to make sugary fatty snack for him. His snack is very low sugar and free from sugary frosting and I try to incooperate fresh fruits etc.. I hope your dogs would like them as much as Palette did. Here is the video to show you how much Palette loves the pupcake. One slice of the cake served is 52.5kcal. So, Each pupcake is still lower kcal than 1 tbs of peanut butter served (1 tbs peanut butter is 90 kcal). You can certainly cut the cake into quarter, and feed it to your dog to lower the daily intake from treats. If you follow my blog entries, you would notice that our Corgi “Palette” is on fresh food diet a.k.a. raw diet, and she eats all kinds of stuff. She loves the fresh food menu very much. She always start her day by trotting to the kitchen,nose up in the air to sniff out what is for breakfast today. Then, when she knows it is her meal time, she waits “nice sit” at the spot where I normally place her food mat on. She already learned her meal routine very well and, I do not need to call her for the meal time. For now, since we have new addition to our family; our little prince “Liam”, her routine got changed a little but she already learned when her meal is served and what the cue will be. I, on the other hand, enjoy watching how much she loves her meal and I feel great knowing that I am providing the best menu possible for her for healthy,long,happy life. It has been 8 years since her first raw diet menu. I started off by introducing chicken menu without organ and then, introduced another protein one at a time. She did pretty good on the menu except a few learning curves,where I learned that she has sensitive tummy for fat % in one sitting and I need to trim some fat from fatty protein source such as Duck or limit the amount of food served due to higher fat content in the menu such as lamb tongue. Once I learned that, feeding became second nature to me and, I am being able to adjust to my own personal preferable way of feeding. Personally, I Prefer to provide variety of protein source in shorter period of times as opposed to buying single protein source meat in bulk and feed through over a month or two months or more, and then switch to other protein source. Therefore, you would find more than 10 variety of protein source in Palette’s freezer. For that personal purpose, what I did during the introductory phase of the diet was that, I wrote down I like to feed to her, and let her get used to the protein source one by one. Then, after about 2-3 round of feeding following the list of items I wanted to feed, I started feeding mixed/match menu. Therefore, sometimes, her meal is not just one protein source such as beef menu at AM, Turkey Menu for PM, and sometimes both breakfast and dinner are the same protein source but different menu. It all depends. As I have been writing in many entries in the past, after switching her diet to the fresh food diet, I started learning more about overall health topics such as over vaccination, nutrition, along with dog treats,dog food matters and more..
One of my goals for this blog has always been trying to focus on educating readers by passing all of those information that I have learned over the years and, at the same time, I wanted to raise the awareness of healthy, nutritious fresh food diet for dogs, and encourage people to start trying to add fresh food diet menu in their doggy bowl, or start switching training treats or chews to healthier ones to start with; start switching what they get throughout the day via a small steps at a time for the sake of dog’s health. Since I have started the series titled “Decoding kibble”, I am hoping that the series help people to understand what are in the kibble, how you can pick the better brands of kibble if fresh food diet was not their option. If one was trying to switch their diet to fresh food diet a.k.a. raw diet like I did for Palette’s, then, I wanted to provide information how I feed her as fresh food diet guide so they can see what it is like to feed fresh food diet to dogs. As you know,the good diet is the base of overall health. Processed food is convenient and quick and easy for you, but if you were on total processed food diet without fresh food, will you be healthy? Imagine your diet consists of canned soup, frozen food etc only,day in, day out. Now, I cannot wrap my head around why so called “Medical expert” for animals should be pushing you or recommending you to feed the process food as opposed to encouraging you to feed fresh food for the overall health. Even Rachael Ray,who is very passionate about bringing fresh food menu for school lunch is having her own line of kibble, pre-made wet food and I find there is a little discrepancy in the message she is sending to the public. I am sad about that. If she were real passionate about dog diet as much as she does for kids’ lunch menu at school, then, she could have worked on freezer dried/dehydrated food instead of kibble or wet dog food; much simpler, less processed food, and she could promote healthy diet for dogs and cats as well. I feel that medical expert on animal field is moving backward in stead of moving forward focusing more on dog’s health. I strongly feel that vet is moving backward on the diet issue for animals especially because all of my cousins and neighbors who I grew up with fed fresh food all the time and, I had an impression back then that it was what dogs eat until I came to the states. Raw diet menu for dogs, for example, is unique in a way that each menu is served fresh, without fillers, and offer quality of food and, it will leads to good overall health. Ultimately, you can tweak the diet menu if problems arise accordingly. That is the virtue of this raw diet method. As you have noticed, I have started the new series on raw diet titled “Fresh food in the bowl”, where you get to sneak peek what Palette is eating. Generally, Palette’s regular meal is consists of one meal with bone, and the other meal without bones. Meal with bone can be portion cut poultry, 4 leg animal’s ribs, whole fish with poultry feet etc..
Other half of the meal is whatever planned to feed in the menu list in order,and it is boneless meat along with organ such as liver with or without miscellaneous items such as a whole Egg. I usually feed the same menu item two times per week and move on to the other menu except organ such as liver or poultry giblet such as gizzard. The amount of food served is roughly around 10 oz to 12 oz per day. 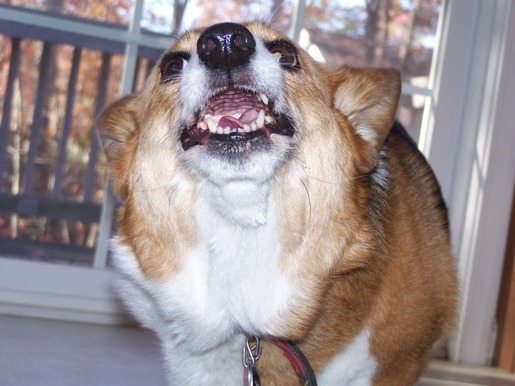 I consider her ideal weight is 30 lb since she is a tall corgi (14″ tall; 2″ taller than average Corgi). Then,I go by 2 % of ideal weight to calculate her daily amount. With some menu items, it is not likely to be able to cut to the piece into exact amount that I would like to feed as her portion, so her daily amount can vary some. Generally, dogs’ feeding amount guideline starts with 2% of ideal adult weight. If that daily feeding amount was too little, you would up the % to 3% , 4% ideal adult weight as needed. By observing how your dogs do, up and down the percentage of ideal weight. Palette’s menu detail goes about 80% meat,10% bone, 10% organ. When I have organ other than liver such as kidney, I feed 5% liver, 5% kidney a day but when I have only liver,I feed 10% liver a day. I feed her 2 times a day on regular feeding time,and I feed 1 time a day when I feed her big meal once a month. If you go by 80 % -10 % -10 % guideline exactly with Palette’s feeding amount, you will get 8 oz boneless meat, 1 oz bone, 1 oz organ, but as you can see, I feed her 2 times a day and when I portion cut her menu, often times, boneless meat is cut to about 4 oz wt, meat with bone such as portion cut chicken etc will be cut to about weighing around 5 oz to 7 oz, and organ portion gets chopped to about half an ounce and then I bag them in the zip bag and put those in the freezer bag to freeze them. With my way, the amount of bone gets up and down depending on what you will feed. When fish meal day, the amount of bones are very low and when I feed neck or ribs as part of her daily menu, the amount of bones in the meal gets higher than fish meal day. The week I took the picture of her meal was Beef meal day. What she got? Here is what she got on beef meal day. It was surf Turf meal day. As you can see, her meal is very simple. 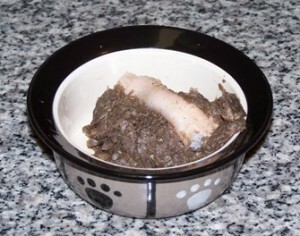 In this entry, I would like to share Palette’s “Fresh food in the bowl; Beef menu”. I think if you already feeding your dogs raw diet for a while and if you know your dogs do good on each items that you see in this entry, then, you can use Palette’s sample meal as example for the feeding. However, if you were new to the raw diet, please do not feed variety of things all at once. During the introductory phase, each protein source menu must be introduced to your dogs one at a time,and keep the dogs on the protein source until your dogs do good on, and then, you can move on to the next protein source and as they get used to the menu, keep introducing new stuff slowly one at a time to be able to feed variety of items. The Beef Trachea is raw trachea and it was meatier (thicker) than I was expected, and was long so, I fed it as meal rather than snack. 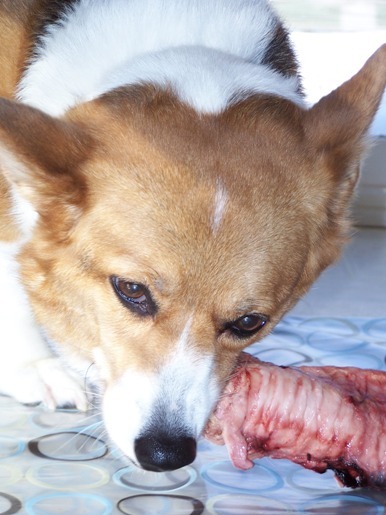 Good thing about trachea is that it is very good natural source of glucosamine/Chondroitin and good for dog’s joint health. Palette used to limp when she was a puppy and, she became fine after she was on glucosamine/chondroitin. NZ green lipped mussels supplement for her joint care (You can read more on her experience for the joint problem at the previous entry titled “Run like wind again” here.). However, I still do give food items such as trachea, weasand (gullet), poultry paws etc that are rich in glucosamine/chondroitin in her diet or as treats. When I first introduced raw trachea long long time ago, it was with Emu trachea. It was much much shorter because I asked the farmer to cut it in 6″ long and I remember the trachea was much thinner than beef ones that i fed the other day. Texture-wise, it was chewy and I remember Palette was chewing for so long. I felt like it would be nice teeth brushing for molar/incisor teeth for dogs:-) Of course, it would not clean their front and canine teeth though because they do not use those teeth to chew it off. Unfortunately, the place that I got her beef trachea (raw) does not carry Beef trachea in whole form anymore (they use it for ground products) and I cannot offer the same to Palette, but Palette did enjoy munching on her raw beef trachea meal. If you would like to find great treats for your dogs, get the one with health benefit over chew pleasure treats such as bully sticks. Bully sticks are great chews, but I personally prefer treats with health benefit because dogs can enjoy treats AND they can receive something more than tasty treats time; better health. 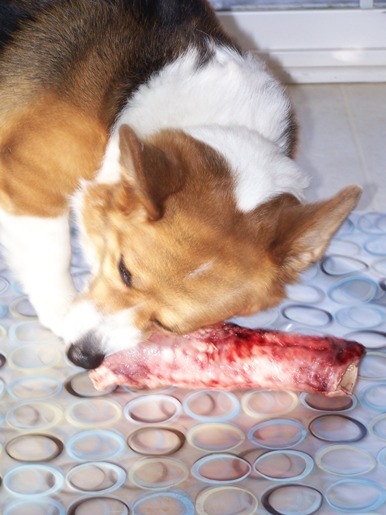 Generally, raw beef trachea can be sold through raw food suppliers, but it is rare to find whole raw trachea because many places use the trachea for dehydrated treats or use it for ground products. For the dinner time meal, I fed whole sardine. Sardine, herring,salmon, and mackerels are great fish to add to your dog’s diet because they are rich in Omega 3 fatty acids and great for coat and skin for dogs. If you are thinking about adding fish to your dog’s diet, try the fish with health benefit as pruority because all of these oily fish contains much more Omega 3 fatty aids than other type of fish you can find at the fish counter. The duck foot that I fed… poultry feet is great natural source of glucosamine/chondroitin, and considering Palette’s past limping history, it is a good choice. I usually have Chicken feet or Duck feet. I had Duck foot in the freezer so,I gave the Duck foot to her this time. Yassy’s Gourmet Dog Kitchen carry dehydrated sardine treats , Dehydrated Chicken feet , Dehydrated Duck feet. Beef trachea is as big as my head! Eating with one eye opned,lol. I am busy, talk to my paws…. 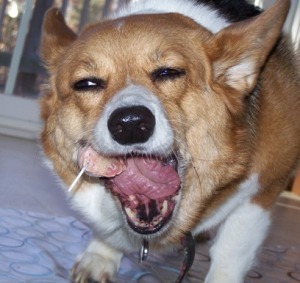 Think I am getting tired of chewing….So chewy! I love Beef Trachea breakfast! You did not see my side dish because I ate in gusto! I would like to share Palette’s Beef Trachea meal time video from youtube. If you are a blog subscriber,please click here to watch the video. What fresh food does your dog get in their bowls? It has been 7 years since her first raw diet menu. Yes, Palette does have her own freezer and,having freezer for storage for raw feeding is the great to stock up the various kinds of protein source at once. When you go to human doctor, not many doctors would discourage you to eat fresh food, and they would not push you to include processed food in our diet. They do not have canned soup or frozen food for you to purchase to bring home to enjoy.They are more likely to tell you to eat fresh food for your over all health. The week I took the picture of her meal was Turkey meal day. What she got? Here is what she got on Turkey meal day. I do not consider the Turkey drumstick big meal day menu, but one drumstick weighed about 14 oz,which is a little over Palette’s one day worth of meal amount. So, when I feed Turkey parts weighing that much,I feed Palette one item around 1-3 pm as brunch,if you will. Parts like breast area would be able to cut into her portion for PM feeding amount,for example, and when I feed that, then, I would feed her two times a day with different protein source on the other side of the meal time. Now and then, I find people asking how they can feed Turkey. At the grocery store, with poultry items, you can get to have options of purchases;whether you buy parts by part vs whole bird. If you simply look at price,then, parts by parts might look cheaper but, I would suggest you buy the whole bird because it will end up feeding your dog cheaper than you would with bony parts by parts items. Chicken will be a good example for this. Lets say you would buy leg quarter. That would be ok for a couple of days on it but know that those items are bone heavy items and you would probably want to feed less bony parts like breast with rib bone area here and there if you feed once a day, or more boneless meat on the other side of the meal if you feed twice a day to balance out the bone amount over time,and to prevent them from getting constipated from too much bone in the meal. 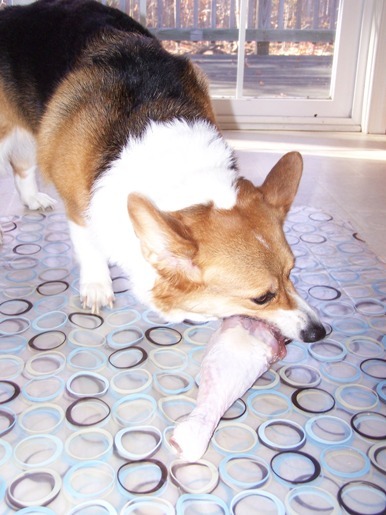 Not only that, if you do buy a whole bird,your dog can eat various parts of bird over time, and more balanced in terms of bone amount and probably nutrition as well. I personally buy a whole bird, and cut them into Palette’s portion.Then, bag them up in zip bag,put those in the freezer bag,store them and feed it through over time. What I usually do for any poultry is that, I buy the whole bird,cut the bird along the spine,which makes the bird split into half. From there, you can cut the half bird into your dog’s portion.If you look at the net weight on the label, it is easier for you to find out how many pieces you would want to cut the half the bird into for your dog. It does not have to be exact number,but you cut them into rough estimated size of the portion and you are good to go! With big bird like Turkey, I do not bother to cut the leg or wing into portion size and just simply leave it “as is” for the day like today;brunch meal day. When it comes to tools that I use to cut the bird, with Chicken,Pheasant,Duck,I find myself use Joyce Chen scissors more. With big bird like Turkey, I ted to use both Joyce Chen scissors plus clever. The best time of the year to stick up the Turkey is the day after the Thanksgiving day. The price drops down and I normally get Turkey for her after the Thanksgiving day for that reason..One big Turkey gives Palette large number of meals. In this entry, I would like to share Palette’s “Fresh food in the bowl; Turkey menu”. For this entry, you would see her eating Turkey drumstick portion but,she is getting various parts of whole Turkey cut into her portion on other Turkey meal day. 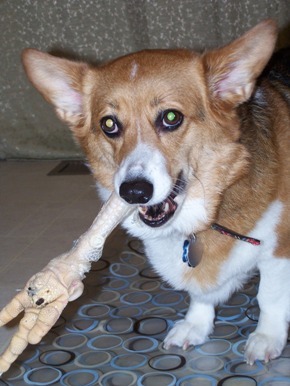 You can feed all parts of Turkey,although with itty bitty size dog like chihuahua, the bone itself might be harder than they could make dent to. If you were not sure if your dog can eat the Turkey bone or not, you can give the meal and let them be for about 10-15 minutes and see if they can make any dent to it. If they could not make any dent to the bone during the time, then, the bone will be something they cannot eat on their own. I use this personal guideline to decide whether bone is edible for Palette or not. It is good to read the entry if you were new to feeding Turkey to your dog. By the way, I have seen the online retail store sells dehydrated Turkey neck and Dehydrated Turkey feet,but be careful for those. 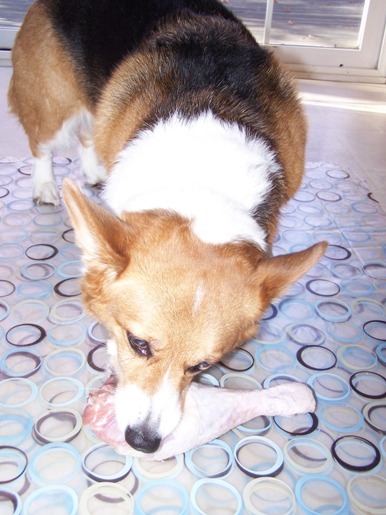 I have fed raw Turkey neck,raw Turkey feet before,but bone in those parts are rather harder than other parts of the Turkey. I am not personally comfortable with the idea those hard parts of Turkey being dehydrated and offered as treats and I have not purchased it to try with Palette. Palette with raw Turkey feet.. I am much comfortable with other similar treats such as dehydrated chicken feet,dehydrated duck feet,which both we,Yassy’s Gourmet Dog Kitchen, carry for dogs to enjoy. Those treats are not hard to chew and, Palette loves them. Good thing about poultry feet is that poultry feet is great natural source of glucosamine/chondroitin, and considering Palette’s past limping history, it is a good choice. I usually have raw/dehydrated Chicken feet or raw/dehydrated Duck feet to trade with big meal day also. Here are some of the pictures and video on the Turkey meal day to share with you. Pausing with my Turkey meal..
Look at my pearly white teethy too! What fresh food did your dog get in their bowl today? One thing I am passionate about is to provide my family and our furriends healthy meals/snacks. I cook for my family everyday, and I make lunch for my husband to bring to work, and we barely have process food on our plate/in his lunch box. 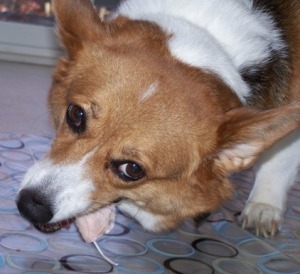 For our stumpy little dog “Palette” the Corgi,we have switched her diet to fresh food diet a.k.a. raw diet 7 years ago, and you would not find processed food items on her feeding mat on her meal time. First lady Michelle Obama has started organic garden at the White house, and hope to encourage people to eat fresh food more. According to cbs news article (For the full article, please click here), the organic garden has 55 kinds of vegetable,berries,and herbs. I have grown sweet peppers,herbs etc and,I must say that sweet peppers right off the plant tastes much better than the one you will get at grocery stores. I think that bringing the fresh food more on our plate is good thing,and better for our health. Less preservatives, less sodium, less sugar, less additives..all of these benefit for our health. As you already know, I am expecting our little son to be born in this summer, and we recently visited a few pediatricians to be ready to be seen when little Liam (That is his name to be) is born. Both small practices,which I like because our little Liam would not see bunch of different doctors and doctors would get to know him better and Liam will get to know the doctor better and we were looking for the small practice. The first one turned us down because they were swamped,and we were told they were not accepting new patients at the moment. They gave us list of other pediatricians in the area to try, but none did not sound good to us. After all, just recently, visited another pediatrician,who we think she is very unique in the field. Then, each exam room is named after vegetables; newborn baby room is called sweet pea room, toddler exam room is blueberry room, and other examine room had carrot room etc..
Every now and then, the doctor hold cooking class inviting all the patients (kids) and parents. Therefore, not only we get to learn healthy eating there, but also we get to mingle with others and kids can make friends there as well. The practice is run by a single doctor so, we know Liam will get to see her every time we come so, we liked that part as well. I thought her philosophy behind the practice and my own belief for both human and for dogs click and we decided to have her as Liam’s pediatrician. I think it will be great to see more doctor like her in the medical field for human. For doctors for animals, we should be getting doctors who push the fresh food diet as opposed to process food because I believe that whether it is for human or animals, the base of the good diet effects overall health and I do not see that highly processed food be any good for animals’ health. It is sad to see that animal doctors are not promoting real issue that largely effect animal’s health; importance of the fresh food in the diet. 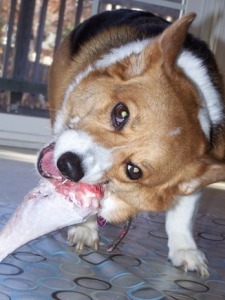 Through the raw feeding 911 series on this blog, I have shared many of the topics you might find it interesting to read from the basic of raw feeding such as what to feed,how much to feed,where you can get the food etc… to other specific topic such as how to feed fish to your dog etc. In this entry, I would like to focus on Green Tripe. If you have started feeding raw diet, you would have heard of the term “Green Tripe” and some of you already got them in your freezer and feeding it to your dogs. What are they? And Are there any benefit to feed them to your dogs? Palette;What is that? What is that? Is it my Favorite Tripe?? When you start shopping for fresh food menu for your furriends, many of the stuff to be on their plate can be found at the grocery store. However,there is one thing you would not find at regular grocery stores. That is green tripe. It is unwashed stomach from ruminants (who graze grasses) such as cow and lamb. Ruminants animals have 4 stomachs; rumen, reticulum, omasum, and abomasum. According to greentripe.com website, when animals swallow grass, the grass goes to rumen and reticulum, and grass gets regurgitated,chewed,and regurgitated grass goes down to 3rd,4th chamber,namely, omasum and abomasum. There,grass gets broke down with gastric juice,enzyme,and amino acid. To read more on green tripe at greentripe.com website,please click here. You may find the scalded,deodorized white colored tripe at grocery store, but it is not what we raw feeders would feed to our dogs. The one we feed is unwashed,unprocessed tripe, and it cannot be sold as human consumption. You would never find those at grocery stores near you. 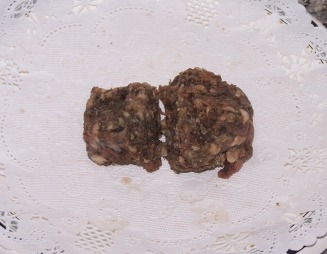 The color of the tripe is brown/grey and sometimes it has green tint from grass cow has eaten. You can get them through raw feeding vendors or your local co-op in your area. With Green tripe, you can get them in 2 forms;ground or unground,uncut. Green tripe in ground form..
Green tripe unground, whole cut into Palette’s portion.. If I feed the ground form of green tripe,I usually feed them as side dish about size of ice cube. It is just my preference. When you feed the small sized green tripe, its smell is minimized. The tripe smells like .. barn in the hot humid summer. Since I feed small sized tripe, it gets gobbled it up by Palette in a blink of an eye and I barely smell the tripe. I usually cut the ground form one into ice cube size when it is about 20% thaw when we receive it in the tube and then, bag them up to freeze. When I get the whole unground,uncut Green tripe, I cut them into Palette’s portion and feed it as part of regular meal,not side dish. The whole tripe looks like well used rug. I find that ground tripe smell more than hunk of tripe. Therefore, I usually get unground,uncut Green Tripe for Palette. With hunk of tripe, it does not get eaten right away and I find her chew,chew,chew to eat it but the smell is much less compared to the ground form of green tripe and I do not smell as much. Many dogs loves them very much. Now you may be wondering what are so good about these smelly things. Do you know why? What are the benefit of feeding tripe? Good thing about green tripe is that it still has enzyme in the tripe and it helps your dogs to digest their food easier. It also has good bacteria for guts (lactic acid bacteria),which you would often find in yogurt or probiotics. These good bacteria can support the good immune system and keep the bad bacteria such as e-coli,salmonella in check in the gut. Besides probiotic effect in the gut, the green tripe is said to have 1:1 ratio of calcium : phosphorus. Also, Green tripe has good ratio of Omega 3 fatty acids ( linolenic acid ) and Omega 6 fatty acids ( linoleic acids ). However, as with any food items, more is not always better. As I understand it, green tripe lacks in tyrosine (amino acid), which you can find a lot in the red meat. So, even if you will feed the green tripe, you will still need the variety of food on their menu. Do not feed Green tripe exclusively. Is Tripe being fed as organ? This is the very question that I had when I started feeding raw green tripe. I was not sure if it fed tiny amount as organ or if it can be fed the same amount to regular boneless meat menu. Turned out, tripe can be fed as regular meal,not organ.Palette did not have any digestive problems when I fed the same amount that I normally feed the boneless meat in her combo meal;She gets 2 meals a day usually,and one meal is bone-in,m the other meal is boneless meal. Therefore, when I have unground,uncut, portion cut Green tripe, her menu with green tripe would look like this. Canned green tripe vs raw frozen tripe..
Because of the popularity of green tripe, now pet food industries start offering more variety in the tripe products. There are canned version of green tripe, but canned items whether they are canned soup or canned anything, it is cooked with heat. This means, enzyme may be destroyed and nutrient might be less than the amount your furry friends can get through raw green tripe. According to the article written by Sally Fallon Morell with Mary G. Enig, PhD on real milk website, all enzymes are deactivated at a wet-heat temperature of 118 degrees Fahrenheit, and a dry-heat temperature of about 150 degrees. You can read the full article written by Sally Fallon Morell with Mary G. Enig, PhD here. Not only that, with canned tripe, the tripe is not the only ingredient. Ingredients goes.. tripe,garlic,and vegetable gum. Too much garlic can cause anemia in dogs, and when you have choice of getting the plain raw green tripe, why do you choose processed tripe? I noticed some of the canned tripe has fish oil in it as well, but as I understand it, supplement like Fish oil gets effected by heat,light,and air. So, I wonder if the fish oil in the tripe does not get effected by the heat during the production process. I would,personally prefer to give omega3 fatty acids by “real” fresh oily fish (sardine,mackerel,salmon) or give fish body oil capsule. Again,because of the popularity of green tripe, now you find variety of tripe treats as well.However, take a time to read the ingredients list before purchasing them. Some of the treats are not worth the money to pay for because too much fillers (extra ingredients) are in them to keep them price down. If I wanted to offer tripe treats, only ingredient I would use will be Bison tripe. The one simple ingredients would be enough for the dogs to love the treats. There will be no need for makers to add flavor enhancer such as syrup or liquid smoke. If you simply look at the front of the bag “Bison tripe”, you would find it unique and might buy them but it got chicken too! Also, I do not understand why they need vegetables and sweetener,natural smoke flavor (liquid smoke), and salt (to preserve longer?) etc..
What I am trying to say is that, take the time and read the ingredient so you know what you are getting. Our k9 restaurant “Yassy’s Gourmet Dog Kitchen” carry tripe treats as followings. All treats are single ingredients and they do not contain extras/fillers. Make sure to wear the glove when you handle/touch Green beef tripe. Or the smell will linger on your finger. Does your dog love Green tripe? Palette loves them very very much! the risk of illness to cats and dogs as well as humans. The AVMA has approved the policy (you can read their policy on raw diet from their point of view here), and since then, many companies that offer premade raw frozen patties mix from Nature’s Variety, Stewart, Stella&Chewy, Primal pet foods etc.. have started adding the additional processing to their raw frozen food called “HPP (High Pressure Pasteurization)” to eliminate pathogen in their products, which AVMA pointed out as the reason why they vote against the raw diet for cats and dogs for the first place. All of those companies state this processing step is all natural and no change in product color,texture, nutrient, except change in eliminating the pathogen in the product, would that be true to their statement? Besides HPP treatment processing step, to eliminate pathogen in the products, authorities can look into “irradiation” processing but, to me personally, all of these extra step of choice did not sound healthy choice. There are some dog treats irradiated for human/dogs on the market but, would you give those to your dog? Do you think there is no health risk for dogs consuming irradiated dog treats? I get fresh food all da time. Today,I will be getting sardine and a duck foot for da breakfast. I am patiently waiting for mom to say “OK” to dig in! In this entry, I would like to look into what HPP is, What it does to the raw food. What is HPP (high pressure pasteurization)? HPP is the food processing step that use pressure to preserving/sterilizing food (kill the pathogen and inactivate the enzyme in the foods). According to wkipedia website, first, products will be sealed tight and placed into steel compartment containing a liquid,and pumps are used for the pressure. The pressure is applied uniformly applied, and after certain period of set time, pressure is released. KNORR , it states that the protein will be denatured when the pressure exceeds 300MPa (Page 5 out of 45 page documents). At 700 MPa, protein structure changes. At page 18, specific to animal protein that were treated with HPP, it says that pressure changes in muscle enzyme “meat proteolysis”, and “myofibriller protein”. Therefore, as a result, it changes its structure and texture, and it influences the tenderrization, gelatin process of the meat (color) and the extent of Lipid peroxidation,which leads to poor taste and health benefit. This denaturation is due to the destruction of hydrophobic and ion pair bonds,and unfolding the molecules. The PDF documents here from University of Queensland in Australia shows how the raw meat can change its color with various pressure strength on page 24 out of 43 pages documents. If you look at cooked meat picture to compare, you can see that “cooked” meat is not effected by the pressure for the color change. When I looked at the pictures,I wonder if the companies that implement the process of HPP processing did not realize that it is the “cooked” meat that does not change its color with pressure. The HPP processing does inactivate the bacteria but bacterial spores are resistant to the pressure unless this process is done with heat close to 100 degree Celsius (212F). The denaturation of protein with HPP processing can be found at pmc website here as well. M. de Lamballerie, HPP process accelerate lipid oxidation, color,texture change and sensory acceptability. In the PDF document published online at Wiley Online library and written by DianeM.Barrett , and Beate Lloyd, here, you can find the nutrient loss in the vegetables and fruits when they were treated with HPP process. Some are minor but some are more than small amount. Even FDA website here states HPP process will denature the protein and, even if heat was not use with HPP processing. When the pressure is applied, the temperature rises (rise larger especially if the food was high in fat). In average, 3 degree Celsius (37F) per 100 MPa , and its temperature backs down when it got decompressed. Answers Raw Pet Food company here has a good document on HPP processing as their Word document file as well. In conclusion, HPP does change some things in the food; structure, text,color,and in some cases, nutrient content even though all the raw frozen pet food companies say they would not change its texture, color, nutrient except inactivating the bacterias in the food. Even if they do not use the heat when they do the processing of HPP treatment, if the protein source was high fat content items, from what I read through all of these studies and documentations, it looks like it should raises more temperature when they were applied pressure. I wonder if it is the reason why HPP treated vegetables loses its nutrient; because of the heat coming through from pressure even if the temperature gets back down when pressure is released. With common sense, if vegetables does lose some nutrient content, I would think that meat also lose its nutrient content to some extent and would not be zero changes. I also think that HPP processing would effect more on especially the one with high fat content overall. HPP processing at 3rd party facility.. I was curious whether the raw frozen dog food company does the HPP processing on their own at their facility so they can overseen the whole process from the start to the finish. Therefore, I have picked Stella&Chewy company and asked about it. Nature’s variety does say their food gets treated with HPP by 3rd party company, and Stella & Chewy also responded me that all of their products that include frozen dinner, freeze dried treats, everything they offer undergo the HPP processing at 3rd party facility place. To prevent contamination by surface or air-born pathogen, during the processing, they use series of devices that omits low level of pathogen fighting gasses such as ozone and hydrogen peroxide. Do you think that the raw frozen dog food that are HPP treated this way vs untreated raw meat are still exactly the same except pathogen level and still good raw meat to feed your dog? To me personally, I feel that they are the unnecessary processing step with more product cost added with less quality of raw meat as a finished products. Would this application of HPP processing is for the authorities like AVMA to make the cost of frozen raw diet cost to increase and hoping that someone would change their mind and start purchasing kibbles again because of the cost difference? Dogs eat poop, which I think has lots of bacterias in it, but they do not get sick. Tiger and Lion (big cat) eats raw meat and they do not get sick. I have seen cats catches the mice and eat them raw and he did not get sick. Otter enjoys raw fish and they do not get sick. We human also enjoy sashimi, steak tartar, tuna tartar and we are fine. Dogs have different digestive system and,their intestine is much shorter than ours. 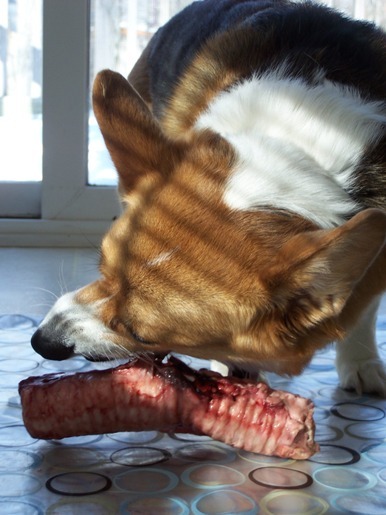 This is why, dogs can digest the raw meat without getting sick from salmonella. When it comes to raw meat, humans are more susceptible to salmonella than to dogs because of our long intestine. meats so we would not cross contaminate the food. To me, it also sounds like this processing step is more for human than dog’s. For me, for our dog’s health, I would still believe that pure raw meat menu is better than HPP treated raw meat even if pathogen is inactivated. Pressure does not kill all of the bacteria and it denature the protein structure. Besides, the processing is done at the 3rd party facility, not at the maker’s facility. If I had to choose the HPP treated food for us human or for pets, I would be more comfortable having it done at the same facility,rather than at the 3rd part facility for the reasons of re-contamination possibility and the maker of the products being blindfolded and not observing how their products are handled at the 3rd party facility. 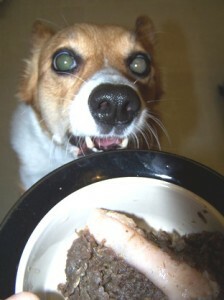 If you feed raw frozen dog food, you should be informed that some frozen dog food is HPP treated, and some aren’t. If you would like to have more information on the products you feed, contact the maker of the products. HPP treated raw frozen dog food vs non HPP treated raw frozen dog food, which would you feed to your dog? Would you feel more comfortable if the food you feed to your dogs are HPP treated? For Palette, last month was a little exciting month because we got tiny bit of snow last month. The snow storm just hit our area left us more snow than January, and our yard was covered with deep snow everywhere. Palette loves snow and she likes to stick her nose all the way through as deep as she can to sniff out whatever it is there and,she was spending quite time playing in the snow than actual potty business on the such snowy days. us, it was nice month despite the fact that we had super cold snow weather here and there. It is because I had an appointment with OBGYN and we could get to see 3D form of our little ones. The little one already had head,arms, and legs and it looked like he/she is growing fine in my belly. I am still considered to be the patient who needs to be monitored closely, and after talking to the high risk ONGYN, it looks like we got lots of tests done and that they told us that we may have risk of premature birth because of my heart shaped uterus,which made me a little nervous but so far so good,and I am currently on 16th week now. Every time we go see doctor and see how our little one is doing, it always lighten up our face and feel so special. newest family member when he/she comes out to this world here as well. will see more of those during cold months’ entries. This time, I would like to share the recipe of “K9 Strawberry banana tiramisu”. Why tiramisu? It is because for the last Valentine’s day, I made strawberry banana tiramisu for my husband and I thought it will be fun to make the K9 version of it. At this moment, I like anything strawberries and, we got lots of berries in the fridge all time so, I was thinking to use some of the berries in her treats recipe so here it is. It came out cute and,Palette loved it. The leftover cake pieces are now used as training treats and she really works very very hard to get it. I hope your dog would like it as much as Palette did. Last month was somewhat exciting month for me because of the snow. I feel we do not get snow as much as we used to in the past and I am waiting for da day where we get super deep snow enough for me to play da “find da tweats in da snow and picnic in da snow” game. “Find da tweats in da snow” game is fun because, mom or dad goes out to hide da tweats in da snow while I am patiently waiting inside da house until they come back to me and say “Go find it!”. Then, I go look for da tweats in da snow. Since I am usually behind da wooden entrance door, I see nothing and I cannot cheat da game. Only thing I need to do is to trust my nose. I sniff,sniff and find da tweats and when I find one, I like to sit there and eat da tweats while snow trucks passes by removing pile of deep snow on the road right in front of our house. Funny thing is that, if I could not find da tweats, I must wait till snow gets melted because even if mom and da thinks they know where they hid da tweats, sometimes, once they back to da house,they sometimes have hard time finding da marker they used to locate the tweats. If you got enough snow to play this game, ask your mom and dad to play it with you.You would enjoy it! Dad told me that I will be having fur-less brother/sister this summer,and I am taking good care of my mom. I usually have her in my sight and,when she looks a little uncomfortable, I come inside da bathroom and stay sphinx style on da floor next to her,staring at her with tilted head. I worry sometimes and, I insists to come in with her for potty time especially when she looks not feeling good. Anyway, how was your Valentine’s day? Mom felt fine that day, and she decided to make me easy tweats and I loved it! I could eat more. Anyway, ask your mom to make this.It is so good! 1. On the plate,put some bottom filling and place one heart shaped cake on top. Here is the video to show you how much Palette loved the K9 Strawberry banana tiramisu. She looks at sides sometimes after finished eating one because she knew there are more on the counter,lol. You can certainly cut one cake layer into two, and make 6 tiramisu instead of 3. The good diet is the base of overall good health for human or for animals. When you watch health related TV shows, or read health related articles, now and then, you would come across the article or TV segment regarding friendly bacteria in the gut and benefit of getting probiotics and the yogurt (Plain one, not the sugary flavored yogurt or yogurt with fruits on the bottom) is often recommended for people to have them for the healthy diet. When you start learning more about healthy diet for dogs, you would also hear the benefit of giving gut friendly bacteria through supplement “probiotics”. For dogs, especially those who had digestive upset issues, supplement “probiotics” is recommended to give them rather than store bought yogurt. It is because the number of gut friendly bacteria,namely, acidophilus present more in the dietary supplement than store bought yogurt. Now, what is “probiotics” anyway? The probiotics are the live gut friendly bacterias to help support the balance of the bacterias in the gut when dogs got digestive upset and offset the balance of “good” and “bad” bacterias via diet,stress (moving,new environment,diet change), or via antibiotic treatment, which kills gut friendly bacteria and need to restore the balance of the “good” and “bad” bacteria in the gut during and after the antibiotic treatment. If your dogs were put on antibiotic treatment and your dog has experienced digestive upset, it is because antibiotic kills the good bacteria to heal the infection. That is when you need to give good probiotics to your dogs during and after the antibiotic treatment to help balance the good” and “bad bacteria in the gut. The most well know strain of bacteria as “gut friendly bacteria” is called acidphilus and,you can also find the same bacteria in the store bought yogurt although live culture number is much smaller in the yogurt. If you do feed raw diet to your dogs, Green tripe also contains acidophilus as well,although number of good bacterias might be less than dietary supplement “probiotics” can offer. Because of how acidophilus works when certain situations occur, it is helpful to give probiotics to your dog when they happened to be under the situation that might trigger the digestive upset before they experience miserable digestive upset experience. If your dogs were gassy, sometimes, it is the sign of indigestion and giving probiotics to them also could help them to digest the food in the question better. I remember Palette was quite gassy when she was on kibble as a puppy. Every time she stretched out her boddy by running up the stairs, standing on her hind legs,putting her paws on the table, we heard her cute “toot”. Sometimes, when she was gassy,it accompanied with vomit on the floor as well. Some people give probiotics daily,but personally I give/gave probiotic to Palette when I was trying to switch her from kibble diet to fresh food diet,a.k.a. raw diet until she could handle the raw diet menu on her own,plus when she was on antibiotic treatment,and whenever she had digestive upset. When she was on antibiotic treatment, our lady vet told us to keep her on probiotics for 3-4 days after the treatment as well but it was not enough for her to fully digest food on her own without digestive upset. For her, she needed during and 30 more days after the treatment was over. If your dogs were put on antibiotic treatment make sure to keep them on probiotics as well until they can fully digest the food served to them on their own. What are the benefit of giving probiotics to your dogs? For starter, giving probiotics is to keep their “good” and “bad bacteria” balance in check and to restore the balance of the “good” bacteria and “bad” bacteria in the gut. Besides that, what probiotics can do? These beneficial bacteria like acidophilus can out compete the bacteria like e-coli,salmonella etc, and prevent them from colonizing in the gut. Also, these friendly bacteria produce Lactic acid,which increase the acidity level in the large intestine,which is not a good environment for pathogenic bacteria but good environment for good enzyme activity. Elizabeth and Laura suggests that for probiotics to be able to survive and reach to the intestine to do their jobs, best way to provide probiotics to your dog is to give probiltic in high concentration; larger number of bacterias such as billions,millions of bacterias. This is the reason why food source like yogurt might not be as effective as you may think. According to the article written by Elizabeth Pask and Laura Scott for the modern dog magazine, the probiotics is measured by number of Colont-Forming-Unit (CFU) per gram of probiotics. Therefore, their suggestion for purchasing the good probiotics is to look for the one with billions,millions of CFU per gram. To read the full article by Elizabeth Pask,and Laura Scott for The Modern Dog Magazine, please click here. What types of probiotics you should get for your dogs? When you start looking around what form of probiotics are available, you would notice there are liquid type, powder form, and gel type of probiotic. Some probiotics,most often liquid type of probiotic require refrigeration once it has been opened. As Elizabeth and Laura wrote in their article,I would look for the one with large number of probiotic. Besides that rule, personally,I prefer to have product that got simple ingredient list rather than length ingredients in the list.Because each was described as good amount of bacteria in the products, I tried once even if it had longer ingredients list but now I think for Palette, herself, does much better with least number of ingredients in the list. What I give to Palette for long time as staple now is “Acidophilus plus” from pet authority,and it has only 5 ingredients as shown below. Since Palette does great on it and I liked it very much and using it long enough, I started carrying it at Yassy’s Gourmet Dog Kitchen as well. You can find the product here. People tend to think “more” is better but I rather think that simple is better with good concentrated number of good bacteria in the ingredients list without fillers. Personally, I have tried all 3 forms. As a puppy, I got Palette powder formed probiotics.Its advantage is to be able to keep them at room temperature and looked lasts longer. Plus it was described as it got 100 millions of bacteria in CFU. 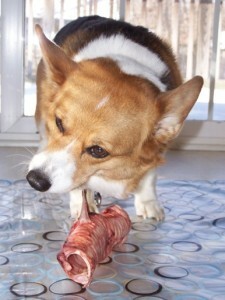 However, when I gave it to her, the digestive upset did not improve but rather, worsen and I stopped giving it to her. Maybe she did not do good with whatever was in the ingredients list. certain amount of probiotics through the pen style syringe. product, Dried Pediococcus acidilactici fermentation product. I tried this gel one just because it said to have 20 billions of bacteria in CFU,and it did healed Palette’s digestive upset quite fast. However, when I gave it to her, she was very farty. ingredient list,works well with Palette and does not make her farty. Acidophilus plus needs to be refrigerated once bottle is opened. This is dairy free products.It does not say specific number but, it states it has lactobacillus acidophilus cultures and it got billions of friendly active micro organism. list for the ingredients and has good number of acidophilus in it. In addition to that,I prefer the one our dog does good on. When it comes to digestive upset for dogs, people often talk about giving pumpkin for the quick fix. However, is it the good move? When you think about it, when digestive upset occur, it happens due to imbalance of “good” and “bad” bacteria and, giving fiber like “pumpkin” can fix visually but how about internally? This is only my personal opinion but, when dogs are experiencing digestive upset, giving good bacteria back into their gut seems more reasonable to me. Also, when your dog experiencing digestive upset, be sure to find why he/she is experiencing the digestive upset. Otherwise, as long as whatever cause does exists, the digestive upset can happen over and over again until you will fix the cause of the problems. Quick fix like giving pumpkin looks fine visually but, it is just that “quick visual fix” and as long as problem is there, digestive upset continues and nothing improves overall. Do you give probiotics to your dogs? If so,what forms of probiotics;liquid,powder,gel, do you give and why?